Daniel Evans’ spectacular Sheffield swansong. There’s something of a bittersweet flavour to Daniel Evans’ revival of the Hammerstein and Kern classic. For, Evans has recently announced that he’ll be leaving his position as Artistic Director of Sheffield Theatres sometime in 2016 to take over at Chichester’s Festival Theatre. Which means that Show Boat is the final time we in Sheffield will watch a Daniel Evans musical at Christmas. Which is a crying shame, frankly. Since he arrived in Sheffield in 2009, Evans has made it a tradition to instill a little bit of Broadway magic in South Yorkshire hearts with crowd-pleasers like Me & My Girl, My Fair Lady or last year’s euphoric, exhilarating production of Anything Goes. He’s not afraid of throwing the odd curveball, either: after all, this is the man who genuinely thought: you know what would make a perfect Christmas treat for Sheffield’s theatregoers? The famously bleak and blackly comic tale of a 30something bachelor with a crippling fear of commitment that is Stephen Sondheim’s Company. And you know what? He was bang on the bloody money. Show Boat too is not exactly cheery. Oh sure, there are wonderful, timeless songs, there’s dance routines that take the breath away, and it’s got an unashamed old-fashioned sense of romance deep within in it. Yet this is a play in which the leading man becomes an alcoholic and gambler who leaves his wife and child to fend for themselves, and it’s riddled with racial tension with one couple being investigated for miscegenation. So yeah, ‘ave that Santa. If anyone is able to turn this rather dark and ugly period of history into something joyful and uplifting, it’s Evans. 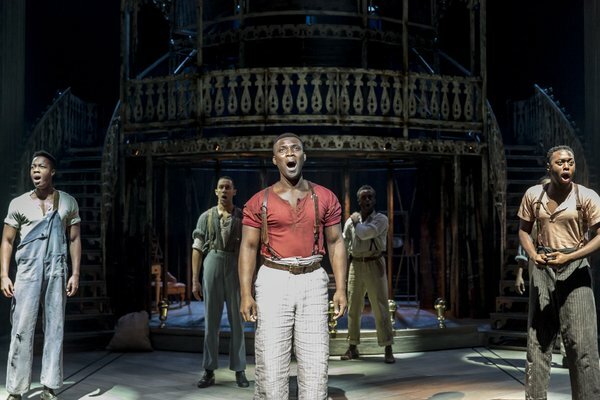 And, from the moment Lez Brotherston’s enormous steam boat hoves onto stage (this is one of the few productions you’ll see where the set generates gasps of delight and a round of applause), you you’re in for something magical. Part of the attraction is seeing how the racially sensitive material is handled – Evans is using Rob Ruggiero’s 2011 version which scales down a lot of the material, but there’s still an eerie power in the Cotton Blossom’s opening refrain of “coloured folk work on the Mississippi….here we all work while the white folks play”. Mostly though, you’re too busy being dazzled by the sheer talent on display. Evans’ cast doesn’t have a star name as such, he’s just rightly gathered a group of musical theatre experts at the top of their game. Gina Beck is an adorable Magnolia, the young, naive captain’s daughter who falls in love with the magnificently named Gaylord Ravenal (played by the outstanding Michael Xavier) – their duet of You Are Love is swooningly romantic as the courting couple persue each other up and down the decks of the ship. This is very much an ensemble piece, and almost every member of the cast has an opportunity to shine – be it the stunning group performance of Can’t Help Lovin’ Dat Man or Emmanuel Kojo’s standout rendition of Ole Man River, which is powerful enough to fuel an entire village for the winter. Rebecca Trehearn exudes just the right amount of tragic heartache as Julie LaVerne and there’s a fantastic comic performances from both Alex Young and Danny Collins as Ellie and Frank; Collins in particular seeming to have limbs made from elastic for his show-stopping dance routines. The pace is almost breakneck – in fact, during the second half, almost 30 years pass by in the blink of an eye (with the help of clever video projections) and you find it hard to catch your breath. And then there’s that ending: oh boy, that ending. There SHOULD be something horrendously cheesy about watching two actors in their 30s made up to look like old age pensioners, but when Xavier and Beck come face to face again at the end of the show, you’re watching two people, in one brief moment, contemplate years of hurt, regret and lost love. And, God, can you feel that pain, loss and regret. Cliche though it may be, on this occasion I think it’s accurate to say that there wasn’t a dry eye in the house. As with the best of Evans’ musicals, it’s the sort of show that just makes you want to leap out of your seat during the curtain call and hug the nearest stranger. It’s made me, someone who doesn’t even care that much for musicals, someone who’s fortysomething, cynical and jaded and whose theatrical highlights of the year included watching Christopher Brett Bailey repeat the word ‘jissum’ a seemingly endless amount of times, feel this moved. This is Evans’ genius, it’s why Chichester’s gain is Sheffield’s very real loss and it’s why we’re going to miss him so very much.